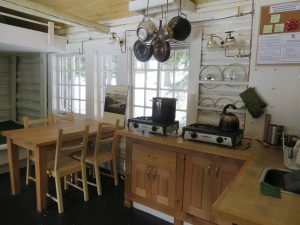 Historic cabin turned backcountry hut in the heart of Waterton Lakes National Park – what’s not to love about the latest addition to the Alpine Club of Canada’s (ACC) collection of places to stay overnight? Cameron Lake Cabin is an historic beauty perched in the southern Canadian Rockies. It is taking the outdoor community by storm. 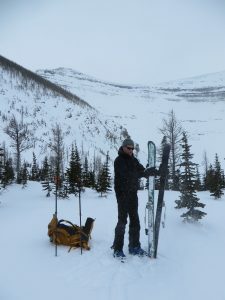 At the winter closure about 13 kilometres (km) along Waterton’s Akamina Parkway, we left the car, donned overnight packs and skis and shuffled in the easy two km towards the cabin. Gently rolling terrain through forest path and roadway made for quick travel. Dusk was setting as we approached our home for the next two nights. In the open meadow, slumping bears sculpted from snow were the only witness to previous visitors. The tiny, 315-square-foot (29-square-metre) log cabin was shuttered and silent. Building began on the Cameron Lake Warden Patrol Station in 1929 and finished the following year. In 2015, ACC volunteers restored the cabin for use as a backcountry hut. Punching in the lock code, we opened the door, tossed our packs inside and grabbed a shovel to clear the path to the outhouse. One by one, the green shutters were opened. Propane tank valves were turned on. Snow was gathered to melt for water. Heading inside, skins peeled off skis were brought inside to dry on the rack above the heater. Sleeping bags and extra clothes were tossed on a double bunk in the tastefully renovated cabin. Propane lights were lit and wine was poured to compliment the cheese and crackers hauled out of the pack. Sitting at one of the two tables, we read the guest log, poured over the historical notes and black-and-white photos in the National Parks book, and settled in for a snug evening full of conversation and crib. Waking early as daylight streamed in open windows, there was time to savour a couple coffees and breakfast bagels and make plans for the day. We could head up to Summit Lake or go over to Forum Lake, just across the British Columbia border (both good snowshoe options as well). Choosing Forum, we headed out of the cabin up to Akamina Pass. At the AB/BC border, snowmobile tracks made for a quick descent to the junction where we climbed up again to Forum Lake, another 4.7 km one-way. Wind howled and we beat a quick – but not before sizing up the old burn slopes for future turns! An evening stroll took us 200 meters to Cameron Lake to watch the star-studded dark sky night. Whether skiing the backcountry, snowshoeing, or just star-gazing, this easy access backcountry experience is a must-do! 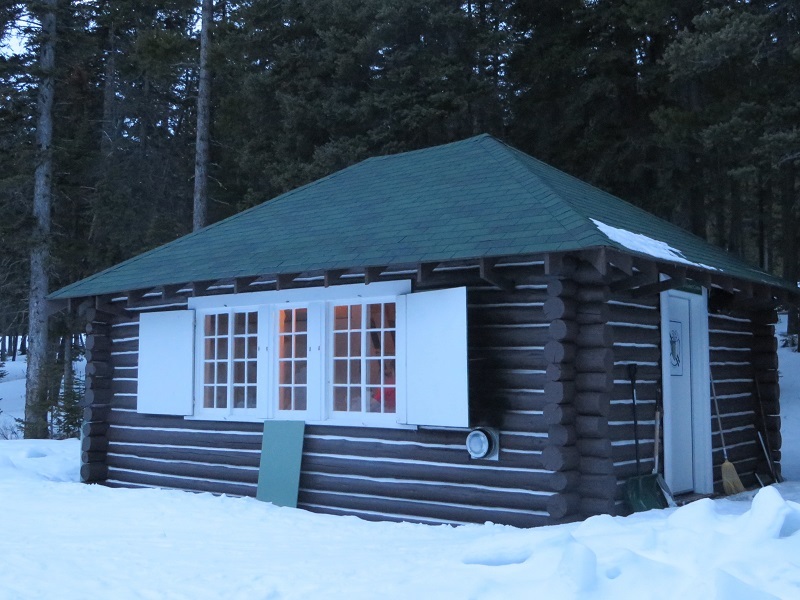 Cameron Lake stays are only available in the winter months, from December 1st to April 1st. Access is by foot, snowshoe, or ski. You can book a stay at Cameron Lake – or any one of the more than two dozen huts found in Alberta and BC – in person at the ACC Clubhouse, east of Canmore off Highway 1A, or by calling 403-678-3200. Additional booking information can be found online at: www.alpineclubofcanada.ca/huts/cameron-lake-cabin/. We will definitely be booking another stay soon!